Plastigauge ® can be used wherever it is required to determine the separation between hidden surfaces. Plastigauge ® was designed and developed in the U.K. during the 1950s. Over sixty years later, it continues to provide a fast, simple and effective method for the measurement of clearance between fitted surfaces and is used throughout the world. Plastigauge ® has a multitude of industrial and engineering applications within the automotive, petrochemical and biomedical fields. It is useful in production, inspection and servicing. Order genuine Plastigauge ® Precision Clearance Gauges online today, directly from the U.K. manufacturer. 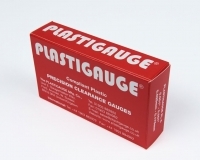 Plastigauge ® is a precision clearance gauge for the measurement of clearance between fitted surfaces. It is particularly useful for measuring clearances in split bearings or in situations where a feeler gauge cannot be inserted. 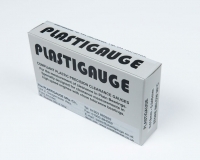 Perhaps the most widely used application of Plastigauge ® is in the measurement of clearance in plain automotive bearings. Flatness and clearance in pipe-flanges and cylinder heads are readily checked and measured with standard Plastigauge ®.